13+ Scion FRS Brake Rotors from FastScions. Drilled and/or Slotted Front & Rear Brake Rotors for Scion FRS. Choose from Performance Brake Rotors by EBC, Stoptech, Hawk, Powerslot & More. Upgrade your braking power with FRS Rotors. 11-15 Scion tC Brake Rotors. Drilled and/or Slotted Brake Rotors for Scion tC2. Performance Brake Rotors are available in Front and Rear from EBC, Stoptech & More. 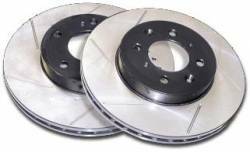 Choose from Drilled and/or Slotted Rotors for better stopping power. 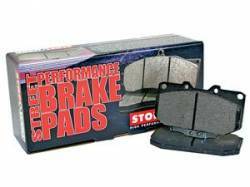 Description: Stoptech Ceramic Front Brake Pads for the 08-15 Scion xB (xB2) 105.12100. StopTech PosiQuiet Ceramic pads offer bite levels similar to or greater than OEM formulas w/ reduced levels of noise & dust. Suited for performance street driving. 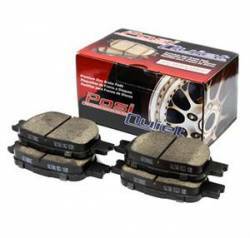 Description: Stoptech Ceramic Front Brake Pads for the 08-14 Scion xD. 105.12100. StopTech PosiQuiet Ceramic pads offer bite levels similar to or greater than OEM formulas w/ reduced levels of noise & dust. Suited for performance street driving. Description: Stoptech Ceramic Rear Brake Pads for the 08-15 Scion xB (xB2) 105.13540. StopTech PosiQuiet Ceramic pads offer bite levels similar to or greater than OEM formulas w/ reduced levels of noise & dust. Suited for performance street driving! Description: Stoptech Drilled & Slotted Front Brake Rotors for the 08-15 Scion xB (xB2) 127.44147. Stoptech direct replacement rotors fit stock calipers. Drilling & slotting helps wipe away the debris that forms between the pad & the disc, adds bite. Description: Stoptech Drilled & Slotted Rear Brake Rotors for the 05-10 Scion tC 127.44115L 127.44115R. Stoptech Drilled and Slotted Brake Rotors help wipe away the debris that forms between the pad and the disc, adds more bite on your Scion tC. Description: 978.44003 Stoptech Drilled & Slotted Sport Brake Kit (Front & Rear) for 05-10 Scion tC. StopTech Sport Kits represent the most in performance value by providing significant brake performance improvements using OEM Sized components. Description: Stoptech Drilled Front Brake Rotors for the 05-10 Scion tC 128.44114. Stoptech Drilled Front Brake Rotors help wipe away the debris that forms between the pad and the disc, adds more bite on your Scion tC! Description: Stoptech Drilled Front Brake Rotors for the 08-15 Scion xB (xB2) 128.44147L 128.44147R. Stoptech direct replacement rotors fit stock calipers. Drilling & slotting helps wipe away debris that forms between the pad & the disc, adds bite. Description: Stoptech Drilled Rear Brake Rotors for the 05-10 Scion tC 128.44115. Stoptech Drilled Rear Brake Rotors help wipe away the debris that forms between the pad and the disc, adds more bite on your Scion tC! Description: Stoptech Drilled Rear Brake Rotors for the 11-16 Scion tC (tC2) 128.44179L 128.44179R. Stoptech Drilled Rear Brake Rotors help wipe away the debris that forms between the pad and the disc, adds more bite on your Scion tC! Scion tC2 Rotors. Description: Stoptech Drilled Rear Brake Rotors for the 08-15 Scion xB (xB2) 128.44161L 128.44147R. Stoptech direct replacement rotors fit stock calipers. Drilling & slotting helps wipe away debris that forms between the pad & the disc, adds bite. 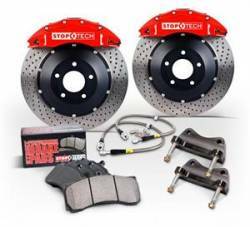 Description: 979.44003 Stoptech Drilled Sport Brake Kit (Front & Rear) for 05-10 Scion tC. 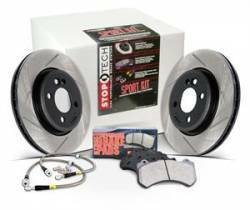 StopTech Sport Kits represent the most in performance value by providing significant brake performance improvements using OEM Sized components. 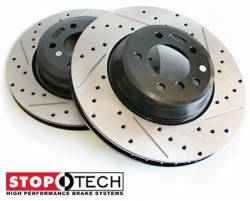 Description: Stoptech Slotted Front Brake Rotors for the 08-15 Scion xB (xB2) 126.44147 126.44147R Stoptech direct replacement rotors fit stock calipers. Drilling & slotting helps wipe away the debris that forms between the pad & the disc, adds bite. Description: Stoptech Slotted Front Brake Rotors for the 08-14 Scion xD 126.44160L 126.44160R Stoptech direct replacement rotors fit stock calipers. Drilling & slotting helps wipe away the debris that forms between the pad & the disc, adds bite. Description: Stoptech Slotted Rear Brake Rotors for the 08-15 Scion xB (xB2) 126.44161 126.44147R. Stoptech direct replacement rotors fit stock calipers. Drilling & slotting helps wipe away the debris that forms between the pad & the disc, adds bite. Description: Stoptech Stainless Steel Front Brake Lines for the 08-15 Scion xB (xB2) 950.44004. Stoptech Stainless Steel brake lines improve pedal feel and reduce time between applied pedal pressure & actual deceleration by preventing expansion. Description: Stoptech Stainless Steel Rear Brake Lines for the 08-15 Scion xB (xB2) 950.44525. 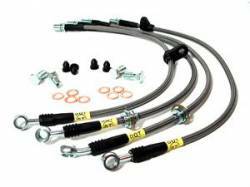 Stoptech Stainless Steel brake lines improve pedal feel and reduce time between applied pedal pressure & actual deceleration by preventing expansion.